Audio Pro Addon T5 review | What Hi-Fi? Paycheques, RAM, pizzas – all these things prove the adage that bigger is better. Addon appears to have taken a similar approach to its Audio Pro T5 wireless speaker, which looks like a beefed-up version of the Audio Pro T3. 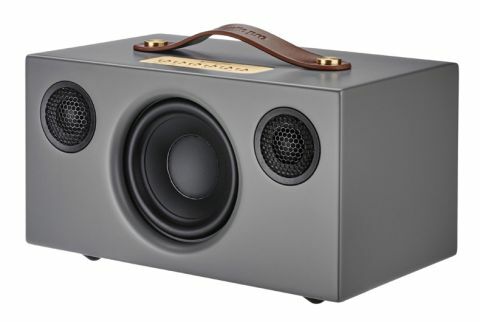 The company’s T3 wireless speaker was a recent What Hi-Fi? Award-winner in the sub-£200 category, earning praise for its comfortable and communicative sound. It’s fair to say that expectations are high for the similarly-priced T5, which is just a bit bigger, but doesn’t have the T3’s portability. The T5 feels heftier than it looks, and the matte housing is firmly built. On its face are a couple of 20mm tweeters with a 10cm woofer in the middle. Bluetooth is king right now in the world of wireless, and the T5 comes with Bluetooth 4.0. It has a plug-in-and play approach – pairing with other devices is simple; just hold down the dedicated button on the top of the speaker. If you’d prefer to stay wired, the T5 has a 3.5mm audio jack, and you can toggle between Bluetooth functionality and its auxiliary input at the touch of a button. There’s also a USB port on the back so you can plug in a Google Cast device or simply charge your phone. This USB is only for power, so you won’t be able to use it for playback. However, unlike the smaller T3 model, the T5 doesn’t have an in-built battery, so this isn’t a speaker to be taking out and about with you. The T5 has the same great character of the T3 – an expressive, well balanced, and full sound – but is given more weight. Christopher Nolan’s sci-fi flick Interstellar revolves around space and time, and Hans Zimmer’s score for the film reflects that. Playing the song Mountains, the T5 has enough heft in its wide presentation to convey the authority of the music. It’s also got a good sense of timing, and that’s certainly vital here. According to movie buffs, each tick in the track (there’s one every 1.25 seconds) represents how each second that astronaut Joseph Cooper spends on the ocean planet is an entire day on earth. The T5 keeps the pace nicely, never missing a beat. From deep space to deep bass, the low pulse in Drake’s Fake Love has a bigger punch than on the T3, tunefully reaching further down the frequencies while still sounding tight. It’s immediately noticeable that there is more emphasis on the drumbeats. The T5 has a touch more insight too, revealing the multiple layers to the swooshing sound effect that punctuates each verse. On acoustic songs like Lady Gaga’s Joanne, there’s more transparency to the soft drums and the squeak of the guitar’s chords changes. There’s the same clarity we would expect in the midrange and treble. We crank up the volume and play AC/DC’s It’s A Long Way To The Top (If You Want To Rock ‘N’ Roll) the T5 takes the high bagpipes and the distorted guitar in its stride, delivering a solid sound. The T5 has a good kick to it, especially in the lower frequencies. Play something upbeat and you’ll probably find your head nodding along within a couple of minutes – but it doesn’t overstretch its boundaries by getting too aggressive as the volume rises. If you’re looking for an impressive stationary speaker, we can’t see a reason why you’d shy away from the Audio Pro T5. You’ll be hard pressed to get something much better without dipping a lot deeper into your piggy bank.